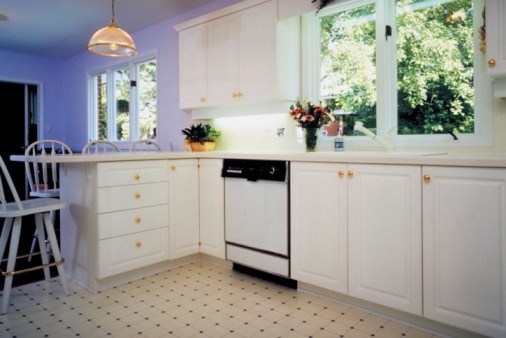 Polished chrome appliances shine brilliantly, and are often found in kitchens and bathrooms. Polished chrome fixtures are not difficult to clean, which is important in rooms where soap scum and other cleaning challenges tend to be common. There are a few rules to remember when cleaning polished chrome. Fill a small bowl or bucket with warm water. Wet a microfiber cloth in the water and place a nickel-sized dollop of liquid dish detergent on the cloth. Rub the detergent all over the polished chrome. Let the detergent soak on any difficult dirt spots for a few minutes. Rinse off the polished chrome with a clean, damp cloth. Make sure to get all the detergent residue off. Pour some white vinegar directly onto a clean, dry microfiber cloth. Rub it over the entire surface of the chrome. Rinse with clean water. Rub the polished chrome with a dry microfiber polishing cloth. This keeps water spots from forming and will make the chrome shine.